The property owners of the 265 Main Street building worked with Biddeford’s Public Art Committee and the Heart of Biddeford, a nonprofit organization focused on downtown revitalization, to commission the mural by artist Julie Gray. Gray’s artwork is a nod to the work of Friedrich Froebel, a German educationalist and originator of Kindergarten. Froebel’s lessons stressed experimentation with simple forms, and the study of nature’s geometry. What do we love about cities? On my short list: fantastic restaurants, a vibrant art scene, a mix of cultures and walks of life, and a fertile environment for innovation and risk. Biddeford not only checks each of my boxes, it’s also having a moment all its own. Describing what’s expected to be the largest privately owned solar development in the state at the Pepperell Mill, Senator Angus King recently called Biddeford “the most dynamic community in Maine right now.” Andrew Knowlton, in his “Portland, Maine, Is the Restaurant City of the Year” story for Bon Appetit, tells readers, “Leave town!” to find, among other treasures, “one of the country’s best cookbook stores, Rabelais.” In a story that spans the country from LA to DC, Eater calls Elda one of “The 18 Best New Restaurants in America.” And in a contest vying for a $150,000 grant from American Express and the National Trust for Historic Preservation, Biddeford’s City Hall clock tower restoration won, garnering more votes than projects in big cities like Los Angeles and Chicago. I am happily imagining the reverberations that the newly repaired clock, keeping real time under its freshly gilded copper dome, will have on this community in the midst of a remarkable rejuvenation (which, I will note, is steps away from the creative space where we produce Decor Maine). A view down Biddeford’s Main Street. The clock tower on City Hall, designed by noted architect John Calvin Stevens, was built in 1894, and has been on the Maine Preservation’s most endangered properties list since 2014. It recently won a national contest for a preservation grant to help restore the historic landmark. Redevelopment efforts abound here, most notably in the mills, which have become a haven for artists and other creative entrepreneurs when the once-thriving textile industry vacated. Real estate developer Doug Sanford’s pioneering efforts reimagined the potential of the mills, and companies like Hyperlite Mountain Gear, creators of lightweight backpacks, tents, and outerwear, Angelrox clothing line, and Saco River Dyehouse, premier dyers of wool yarn and other fibers, have created a mini resurgence of the textile industry here among over 90 businesses in the Pepperell Mill. Less than a mile away, the 233,000-square-foot Lincoln Mill is set for renovation, which will include state-of-the-art loft apartments with a rooftop pool, combined-use restaurant, work and social space, and a 33-room hotel from developers Tim Harrington and Eric Chinberg. After several years in the making, construction is slated to begin later this year. By chance and by appointment, the Leader Bag Co showroom is a stylish addition to Alfred Street. The beloved and critically acclaimed Palace Diner is what first brought me to Biddeford, and their fried chicken sandwich lures me back again and again...and again. I often meet a dear friend, roughly middle ground between us, for a quiet lunch at one of our old favorites: Jewel of India, Que Huong, or Thai ME. On this day, photographer Lauryn Hottinger and I poke around town for some new spots to share. At Suger, home of the Angelrox collection of women’s wear, founder Roxi Suger carries a diverse mix of beauty products, jewelry, and accessories from local makers and global artisans. On Alfred Street, we by chance find Meghan Nesher, cofounder and creative director of Leader Bag Co, in her lovely shop of chic and functional backpack diaper bags, clutches, and accessories. Espousing the values of peace, love, wisdom, solidarity, and kindness, Leader Bag donated profits from their Lead With Love collection to March For Our Lives, a movement dedicated to student-led activism around ending gun violence. Next door, Part & Parcel, a small specialty market, is serving up sandwiches being made by co-owner Ali Preble in an open kitchen, while her partner Danielle O’Neill mans the register. Gleaming-white painted tin ceilings hover over shelves filled with extraordinarily tempting Little Spruce Baking Co. baked goods, spiced honey, pickled veggies, beers, wines, and a fine selection of bath and body items. Farm-fresh produce, cheeses, bone broth, prepared salads, and sandwiches fill refrigerated shelves. Siblings Maya and Balam Serrano dive into treats from Sweet cream Dairy at the Pepperell Mill. Continuing this stylish stretch along Alfred Street is Suger, a boutique brimming with dresses, cardigans, headbands, opera gloves, and leggings from the Angelrox collection of bamboo–organic cotton travel apparel. Each piece is hand-cut and sewn by a single stitcher on American machines just up the road at the mill. The company is notably immersed in the community, regularly making contributions to local programs. We decide to eat dessert first and head to Sweetcream Dairy. Among the offerings: pear crème fraiche sherbert, vegan dark chocolate sorbet, cinnamon cider ice cream with cider doughnut pieces being served by Jonathan Denton and his wife Jacqui DeFranca. What sets their efforts apart is that Sweetcream is a certified milk processing plant, making truly homemade ice cream by pasteurizing its own cream and adding seasonal ingredients sourced from local farms to each batch. Milk shakes, ice cream sandwiches and pops, hot chocolate, and Speckled Ax coffee are also on the menu. Check out their site for their line of ice cream cakes and catering services. Coco Corral’s hand-forged pieces are made with stones from all over the world. At the heart of Biddeford’s creative community is Engine—part contemporary art gallery (we caught a wonderful show of drawings curated by Deborah Whitney, curator/gallerist formerly of Whitney Art Works in Portland, and featuring work by Clint Fulkerson, Noriko Sakanishi, and Grace DeGennaro), part event space (on January 9, hosting its 25th PechaKucha evening of presentations), part arts education organization, creating both adult workshops and after-school arts programs and camps. Among my most treasured possessions are two pieces of jewelry made by the exceptionally talented Coco Corral of Loving Anvil. We’ve made a plan to stop by her and her husband Gil’s home and studio, where she quite literally crafts her one-of-a-kind pieces of metal and stone with love. At their Hogfarm Studios gallery space, Gil Corral creates stunning, often custom, black-velvet paintings and teaches and guides mindfulness meditation sessions. Gil and Coco share some of their old favorites, including ordering in from Pizza By Alex, a family business that has been serving 10-inch, Greek-style pizzas (a thicker crust with cheese to the edges that creates a crunchy topping) since 1960. And among their recommendations for places newer to town: Woodgrain Barbers. “Gil feels like it’s the best haircut he’s ever gotten coast-to-coast including any San Fran, Portland, Oregon, or NYC spots he’s frequented. And I agree! They always send him home super handsome,” shares Coco. Owner and barber Maria Ramos gives those outstanding cuts in her dapper, newly renovated space on Main Street. On our list: Rover Wood Fired Bagels & Pizza has developed a cult-like following, addicting friends far and wide with a selection of baked goods and flavored cream cheese spreads, with offerings like apple cheddar bialys with pumpkin cream cheese. We’ve decided that we want a beach walk and plan to drive 6.5 miles to Fortune’s Rocks, one of the most beautiful strands on the Maine coast. But first a stop at Elements: Books Coffee Beer. We find the place filled with young and old, socializing and studying among the shelves of new and gently used books. Ten local beers on tap, bottled beer and wine, and a wide selection of snacks and small plates are on the menu. Programming includes rotating art shows and live-music sets every Friday and Saturday evening. From Elda’s open kitchen, chef Bowman Brown prepares an inventive menu that changes with the seasons and draws inspiration from Maine’s coast. It’s cocktail hour, and back at the Pepperell Mill, Banded Horn Brewing and Round Turn Distilling each have inviting, popular tasting rooms. And tempting as that Red Right Turn cocktail made with passion fruit syrup, cranberry juice, bitters, and Kristina Hansen’s and Darren Case’s own Bimini Gin is for me, and much as I love that vinyl on the turntable, I show some uncharacteristic restraint and head, on time, to our early reservation at Elda. Chef-owner Bowman Brown’s seafood-centric restaurant has attracted much attention both locally and nationally. The front dining room’s design of exposed-brick walls and modern lighting is warmly glowing with candlelight, and we enjoy a view of the open kitchen. On tonight’s menu: crispy sunchokes with warm Camembert dip; warm peekytoe crab with soft scrambled eggs, carrots, and buckwheat; roasted skate wing with black trumpet mushrooms and charred leeks; and grilled duck with autumn olive and pumpkin glazed in coffee. By the time this issue hits, the menu will certainly have changed due to seasonality and sourcing. 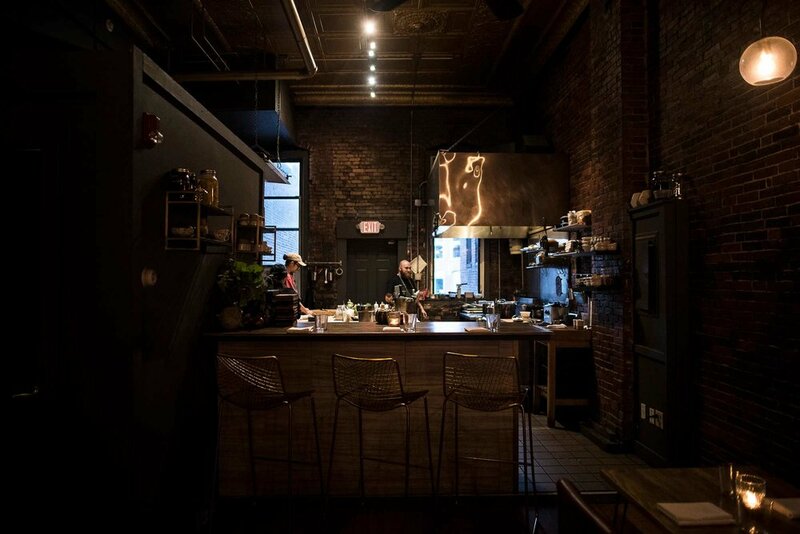 I recommend you head to Biddeford for a meal—and an experience of your own. Fortunes Rocks Beach, one of the most beautiful strands along the Maine coast, was a point of inspiration for Anita Shreve’s 1999 novel Fortune’s Rocks. Writer/photographer duo Susan Grisanti and Lauryn Hottinger recently spent a Sunday wandering around Biddeford, equipped with a short list of recommendations from friends, an early dinner reservation at Elda, and a shared watchfulness. Their discoveries kindled a desire to share the experience in this column, which will continue every month in a new Maine town.